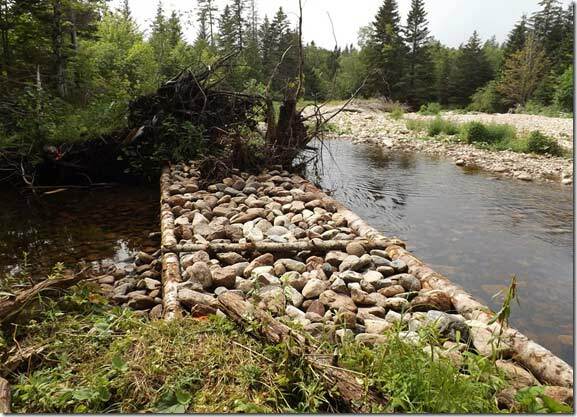 During the summer of 2015, the Margaree Salmon Association (MSA) is once again participating in fish habitat restoration. While bank stabilization on the river is important, work on the tributaries of the Margaree is critical to the life cycle of salmon, trout and other species. These streams provide nurseries for young fish. Unlike the river, they are usually free of free of seals, striped bass, mergansers, cormorants and some other predators. Our work is aimed at keeping streams whole and intact so they can maintain themselves. Floods can clean and deepen channels, where fish may rest during low water events. Structures are typically constructed and rock filled by hand. Some structures include rock walls, rock and log diverters, digger logs and in some instances “fish cover” structures have been built. Our 2015 work team is lead by Edsel Hart and our team includes Derwyn Hart, Peter Poirier & Doug Phillips. Planning, guidance and technical support in the field is provided by the NSSA program manager Amy Weston.We have participated in the Adopt A Stream program for several years. Costs associated with this work are equally shared between the MSA and the Adopt A Stream program. The Nova Scotia Salmon Association (NSSA) has been managing the NSLC Adopt A Stream program on behalf of conservation organizations and the recreational angling community since 1998. Since its establishment in 2005, the Nova Scotia Sportfish Habitat Fund (NSSHF) has been the primary source of project funding of the NSLC Adopt A Stream program. Having dedicated revenue available annually, from the habitat fee on recreational fishing licenses, provides a foundation community groups like ours can access. Without it, we could not regularly participate in this type fish habitat restoration. It is important to remember that structures require maintenance and repair.